The world of business is moving faster than ever. Technology usurps itself on an almost daily basis. Organizations need to compete harder than ever before to stay ahead of the market. Technology, rules and regulations, changing consumer habits and competitive pressures combine to make the need for change both necessary and inevitable. Yet people resist change. They fear it. In this article, you’ll learn how organizational behavior can engage people in transformational change. While there are many change management strategies, most have their foundations in the eight-step model developed by Dr. John Kotter and described in his book, “Leading Change”. However, following this model will not be enough to create successful and sustainable change. Your organization will need to adopt and adapt the organizational behaviors required to engage employees in change throughout the process. You must create a sense of urgency, which compels the entire organization to want change. Discussing poor sales numbers or chatting about your competition won’t achieve this. Identify threats and opportunities. From these, create future visions. Encourage open and honest discussion. Kick-start the dialogue in team meetings and on the company intranet. Engage your employees, and invite other stakeholders to participate – customers and suppliers, for example. Lead from the front, with your senior leaders involved in influencing employees of the need for change. Identify change sponsors throughout your organization from all sources, and use these influencers to build momentum for change. Forget about traditional hierarchies, and identify your organization’s natural leaders at every level. Build a team of influencers, people from all divisions and with diversity of skills. Accept your team will have weak spots, and strive to position the team to cover them or remove them. A clear vision of the future is needed to help all stakeholders understand why there is a need for change, and the ambitions of the change project. Think in terms of organizational values when creating your change goals. Ensure that every member of your change coalition understands these values and goals, and create a common future vision description. Ensure that all members of the change coalition can speak enthusiastically about the future vision and change project with a common voice. Too often, organizations tell their people that things are going to change, but never tell them why, how, or the benefits of change. The reasons for change and its benefits will need to be communicated loud and often. The message will have a lot of competition from ‘business-as-usual’ communications, and for change to be successful it must be a priority. Be open about the change, encouraging people to talk at every opportunity. Ensure your employees are versed in tackling concerns. Focus all communications on the change, from performance reviews and training to operational processes. There are many obstacles to change. The major one, and the one that could bring change to its knees, is employee resistance. Employees especially in the age of globalized markets and automation, can see "change" as code for "downsizing". As a leader, it's important to reassure your team that this isn't what you mean and be able to speak to their fears. If this is what you mean by change then you want to address it head-on because there is likely to be further demoralization. You’ll need to structure your team to maximize its potential, employing change leaders and setting roles and responsibilities in line with their skillsets. However, there are other things that you will need to do. Be passionate about the change and possibilities for all. Ensure your leaders take a persuasive and not authoritarian approach to managing change. Invite employees to put forward their ideas, and reward people for helping to make change happen. Be prepared to restructure your organization and its compensation schemes to come into line with the future vision. Encourage resistors to see the benefits of change, and act quickly to encourage their exit if it becomes clear there is no turning of their attitudes. Aiming for a single big goal can be daunting and demoralizing. You never seem to make any real progress. It’s a little like setting a target to quit smoking, or lose weight, or write a book. Instead, set smaller short-term milestones on the way to the future vision (e.g. cut out that first cigarette, lose two pounds in the first week, write a chapter a week, etc.). Make the targets stretching but achievable, so that they have a high chance of success. Open milestone-setting to all employees: make it a personal goal as well as a team goal. Encourage discussion of the benefits of achieving each milestone, and let employees identify potential barriers. Celebrate the achievement of each milestone, but never rest on your laurels. You have completed another stepping stone toward the future vision. You now need to build on this, by learning from mistakes made and identifying what went well. Be open with all stakeholders, and encourage them to put forward their views and ideas. Celebrate those wins in small ways, reinforcing the cycle. Set the next goals by consensus. Be flexible in your approach, and identify change leaders as they become apparent through the process of change. When you reach the future vision you set yourself, you must ensure that new processes, systems, and ways of thinking and working become central to your corporate culture. Ensure that the benefits of change are evident in every corner of your organization, and that your leaders remain supportive of the change. Discuss the change in team meetings, one-to-ones, board meetings, customer presentations… in fact, at every opportunity available. Make the new values central to the hiring process. Reward key members, change sponsors and employee influencers publicly. Now that your change project has reached its successful conclusion, what next? The only constant in business is change. As I discussed in the opening paragraph, technology, rules and regulations, changing consumer habits and competitive pressures combine to make the need for change both necessary and inevitable. The world of business is an ever-changing landscape. Just because you have completed a largescale transformational change successfully, does not mean that further change is unnecessary. Be open to ideas from the floor – your people and salespeople will prove key to continuous change. Provide a path to employee empowerment – communicate openly, provide opportunity for improvement, share strategies, offer support, and be appreciative. Ensure that leaders and managers encourage feedback and behavioral explanations. Is your organization prepared for transformational change? 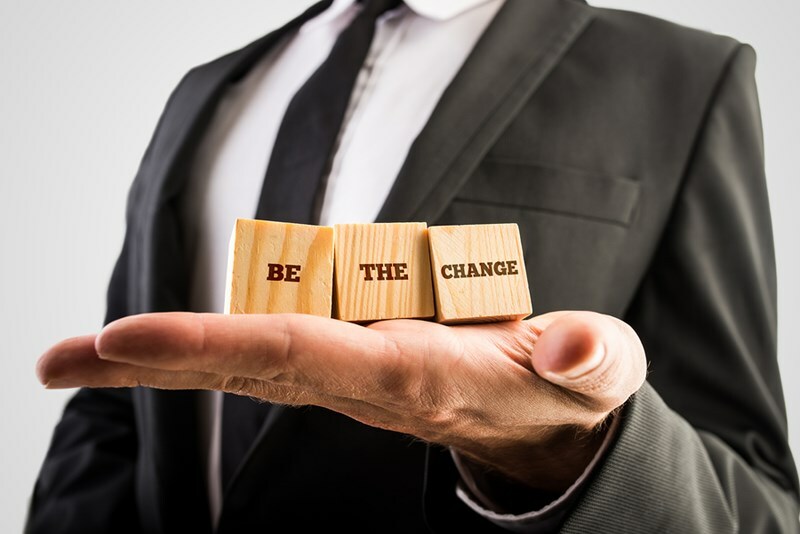 To discover how a Change Agent Bootcamp and coaching in consulting and facilitating will help your organization and leaders produce lasting change, contact Forward Focus today.